Hatchwell Meat Flavoured Toothpaste for Cats and Dogs is the perfect product for animals adverse to the minty flavour of regular toothpaste. 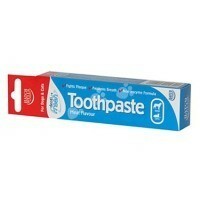 This non enzyme formula is effective in fighting plaque and freshening breath. Look after your pets oral hygiene with Hatchwells Meat Flavoured Tooth Paste for Cats and Dogs!